Performance Time: Approximately 120 minutes, 122 pgs. FARCE. A group of wannabe actors converge at Camp Soap to hone their acting skills under the tutelage of washed-up soap opera star Dirk Svenson. The actors include a man with an enormous amount of testosterone, an idiotic Barbie doll look-alike, a Goth, an insecure dork, a pair of movie extras, and a couple of Dirk-a-holics. Not only do the campers have to put up with Dirk’s enormous ego, his entourage, and his theatrical rants, but they have to sleep on the floor or in chairs since there are no beds in the cabins—only posters of Dirk. 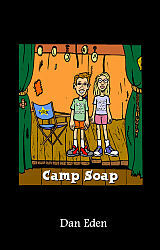 But the campers’ gladly suffer the camp’s hardships after Dirk announces that the campers will be cast in a new soap opera pilot, “The Day Before Wednesday” (Tuesday), which will hopefully launch Dirk’s comeback. The campers eagerly begin rehearsing so they can impress the Oxygen network executives while Dirk unsuccessfully tries to romance one of the campers. Your audience will roar with laughter! Dan Eden, a Chicago native, is an actor and playwright. He graduated from Columbia College Chicago in Film and Video with a focus in Screenwriting.